I like muffins but I rarely crave them, so I have no idea why I needed to make these. I’ve made them before and while they were good, I didn’t like them as much as my daughter and the Cutie Patooties did. Must have been my mood, because they’ve stuck in my mind all this time. For whatever reason, I needed to make them again. Click for recipe. I eagerly mixed them up, baked them, and waited for them to cool. Actually, I only let them cool enough so I wouldn’t burn my mouth. I couldn’t wait to eat them…and they were everything I’d hoped for! They’re moist, dense, and studded with peanut butter chips – just what I like in a muffin. The recipe makes 2 dozen regular-sized muffins, which is just a couple more than I need to eat on my own. Luckily, a friend was turning “The Big 40” so I dropped off a birthday tray at his house on my way to work. Just doing my part to make sure his birthday was full of calories! If you don’t want to share, you don’t have to — these freeze well. This recipe is from Ann Byrn’s Chocolate from the Cake Mix Doctor book, and I think I actually followed the recipe for once! She suggests varying the recipe by combining different types of chocolate chips. I chose to mix peanut butter chips and semi-sweet chocolate chips. In my mind, it’s hard to go wrong with peanut butter and chocolate! Give these a try, and see if you don’t crave them too! Place rack in center of oven and preheat to 350F. Line 24 muffin cups with paper liners. Set pans aside. Place cake mix, pudding mix, sour cream, water, oil, and eggs in large mixing bowl. Blend with electric mixer on low speed for 1 minute. Stop machine and scrape down sides of bowl with rubber spatula. Increase mixer speed to medium and beat 2 minutes more, scraping sides down again if needed. Batter should look thick and well combined. Bake until the muffins spring back when lightly pressed with your finger and a toothpick inserted in the center comes out clean, 23 – 27 minutes. Remove from oven and place on cooling rack for 5 minutes. 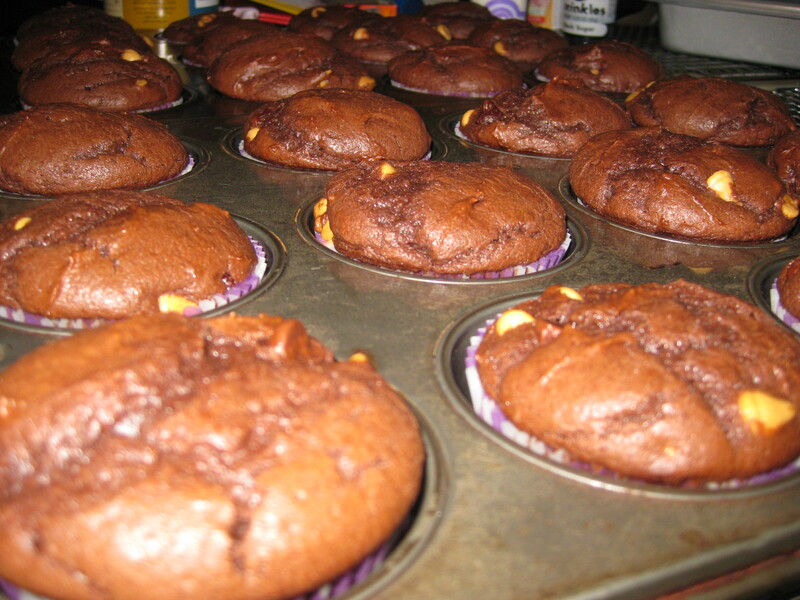 Remove muffins from pan and cool 15 minutes before serving. Dust with confectioners’ sugar, if desired. Note: Store muffins wrapped in foil, plastic wrap or a cake server at room temperature for up to 1 week. Freeze wrapped in foil or sealed in freezer bags for up to 6 months. Thaw muffins overnight on the counter before serving.